Denis Coupal and Linda Leith Publishing launch BLINDSHOT on April 9th, from 5pm to 7pm in a cocktail at Hotel Monville in Old Montreal. All are welcome. 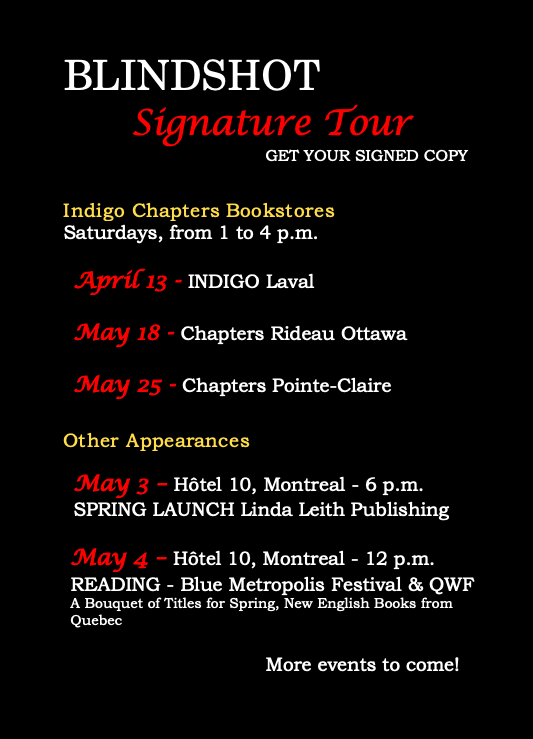 Denis Coupal will be touring greater Montreal and some locations in Ontario to speak about BLINDSHOT and sign copies of his novel. Denis Coupal will be an invited author in the Blue Metropolis Festival, reading from his novel and answering questions, alongside a distinguished group of Quebec Authors, to be held on Saturday, May 4th, from 12 to 1pm.